The 991 GT3 R is a customer race car designed to compete in Group GT3 from 2016 onwards. The uses the production car’s 4.0-litre flat-six with around 500 bhp, running through a six-speed paddle-shift sequential gearbox. Engineers optimised the centre of gravity position versus the old R, using carbon-fibre composite material for the roof, front cover and fairing, wheel arches, doors, side and tail sections as well as the rear cover. All windows including the windscreen are made from polycarbonate to cut weight. The car weights 1,220 kg. By eliminating the side radiators, the position of the centre of gravity is improved, the radiator is better protected against collision damage, and the venting of hot air through louvres in the front cover is enhanced. The two-metre wide rear wing lends aerodynamic balance and distinctive wheel arch air vents on the front fairings increase downforce at the front axle. The GT3 R’s front McPherson strut suspension and multi-link rear suspension are adjustable in height, camber and toe, and there are adjustable anti-roll bar blades at both ends. 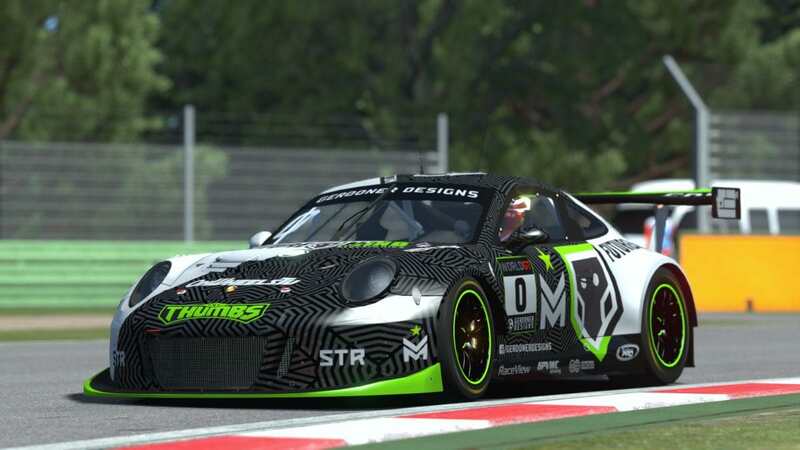 STAX Racing switched from the Bentley Continental GT3 to the Porsche after the first race of GPVWC’s 2017 World GT Series. The livery was designed by Gerdoner Designs.